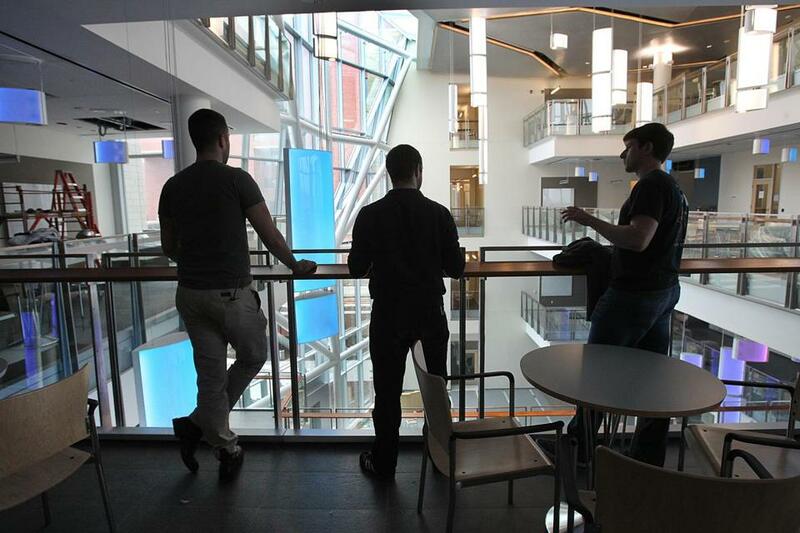 Students stood inside the atrium of the Integrated Sciences Complex at UMass Boston. Facing a budget deficit of $22.3 million, the University of Massachusetts Boston has notified about 400 adjunct professors that their contracts may not be renewed in the fall, according to the university and the faculty union. The news has caused a stir on the Dorchester campus, as professors fear for their jobs and students worry they won’t be able to graduate on time if classes they need are canceled. Many point to the gleaming new buildings rising on campus and ask why the university targeted its lowest-paid teaching staff as a way to save money. “This is draconian,” said Marlene Kim, an economics professor who is president of the Faculty Staff Union. Adjunct faculty are hired semester-by-semester on an as-needed basis. Under the terms of their contract, UMass must notify them by the end of the prior semester if they will not be reappointed. Although many adjuncts have already been scheduled for classes in the fall, the school is reexamining the schedule to meet student demand “most effectively and efficiently,” according to campus spokesman DeWayne Lehman. “We expect that a substantial number of these will be reappointed later in the summer as . . . our funding picture becomes clearer,” he said in a statement. Lehman said Thursday that the campus faces a number of budget uncertainties. The college is not sure how much money it will get from the state this year, trustees have not set the tuition rate for next year, and the campus doesn’t know how many students will enroll, he said. “With all these variables around sources of revenue, the university has taken steps to protect itself contractually,” Lehman said. But students worry the university has not taken steps to protect them. “It might take longer for me to graduate, which is horrible to think about,” said Katie Baima, 25, an English major from Kingston who has one year of studies left before she graduates. Baima said she pays the $13,000 annual tuition with student loans and her job as the editor of the school’s arts journal. “Why are we paying so much to have services cut from us?” she asked. On Thursday night, faculty posted an online petition coauthored by more than 12 UMass Boston faculty, staff, and students, and endorsed by unions representing faculty, professional staff, and graduate students. “NO to increased class sizes, tuition hikes, and cuts to faculty and staff,” it read. Many also plan to speak at the trustees meeting June 15 in Worcester. In a January budget memo to chancellor J. Keith Motley, Ellen O’Connor, the campus vice chancellor for administration and finance, said the college faces greater budget challenges than the other four UMass campuses and must trim between $7.5 million and $9.5 million this fiscal year as well as $11.8 million next fiscal year, which begins in July. Kim, the union president, said some professors have found other jobs and others have offers but can’t decide whether to leave. Many were set to teach full classes in the fall, she said. The professors who received the notices make an average of $12,000 annually, according to the Faculty Staff Union. The faculty cuts are expected to save about $4 million. “It’ll do a lot of damage to do very little if that’s the size of the gap they’re talking about,” she said.